What's the difference between coconut water and coconut milk? There are two natural coconut beverages: coconut water and coconut milk. They both have their own characteristics, nutritional value and uses. I’m sure it was delicious, but what they drank was actually coconut water, not coconut milk. So what’s the difference between coconut water and coconut milk? This is the clear liquid from a young, green coconut. 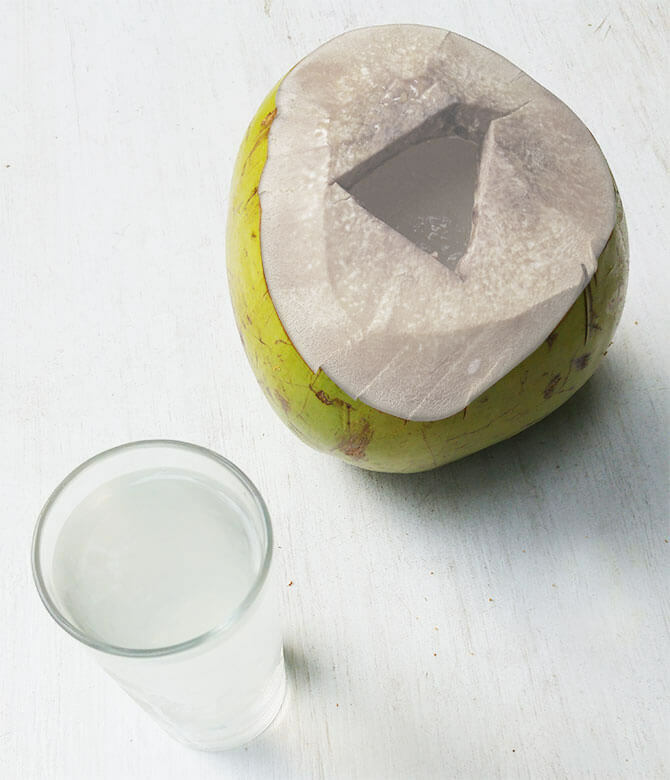 Coconut water is transparent and has a bit of a nutty taste with a hint of sweetness. Natural coconut water is high in electrolytes such as potassium, magnesium and calcium. Electrolytes are important for healthy functioning of cells, muscles, nerves and fluid levels. They also help prevent dehydration. 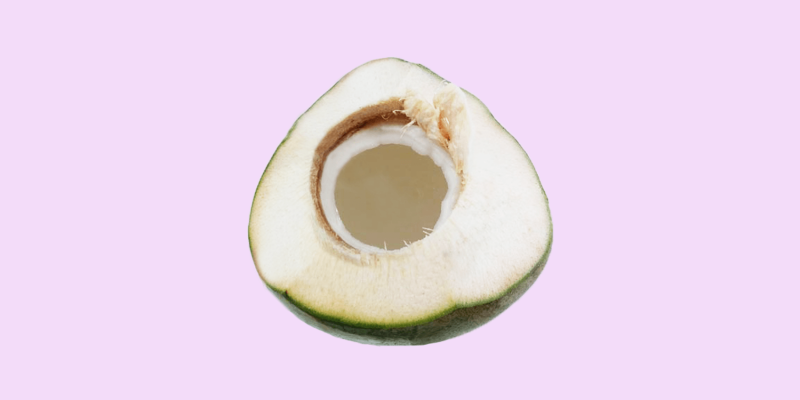 Coconut water aids with digestion and supports the body’s natural detoxification process. It stimulates cell regeneration, has anti-aging properties, supports nutrient absorption and is good for the heart. Fresh coconut water is of course the best you can get. If you buy commercially packaged coconut water, make sure you buy the healthy, least processed kind. The coconut water should be natural, unheated, unpasteurized and not made from concentrate. Also make sure it doesn’t contain any chemicals, added sugars and flavoring. This type of packaged coconut water is sold refrigerated. It should be made from young coconuts. Mature coconuts usually also contain coconut water, but it’s less nutritious and tasty. This is the white liquid made from coconut meat. Very young coconuts only contain water. They then start to grow soft jelly. When they mature, the jelly goes from soft to firmer and finally grows into hard coconut meat. Coconut milk is made from the coconut meat of the mature, brown coconut. You blend fresh ground coconut meat with water and then strain it. This results in a creamy white liquid with a milky consistency. It’s great in smoothies, curries, desserts and in many other dishes. As it’s dairy-free, it makes a great plant-based milk for vegans and people who don’t consume dairy. Coconut cream is the thicker version of coconut milk. It’s more concentrated and contains less water. You can find it in cans in most supermarkets and health food stores. Coconut cream is a popular ingredient in desserts and recipes that require a richer, creamier ingredient than coconut milk. It’s very easy to make your own coconut milk at home. Nowadays you don’t have to live in the tropics anymore to have access to coconuts; many supermarkets and most health-food stores sell them. Like with many things, fresh and homemade really is the best! If you buy coconut milk or cream, look for the most natural kind. Preferably organic, unpasteurized and without artificial ingredients, added sugars and flavors. So what’s the difference between coconut water and coconut milk when it comes to nutritional value? Besides electrolytes, coconut water also contains vitamins B1, B2, B3, B5, B6, B7, B9, Vitamin C, amino acids, living enzymes and antioxidants. 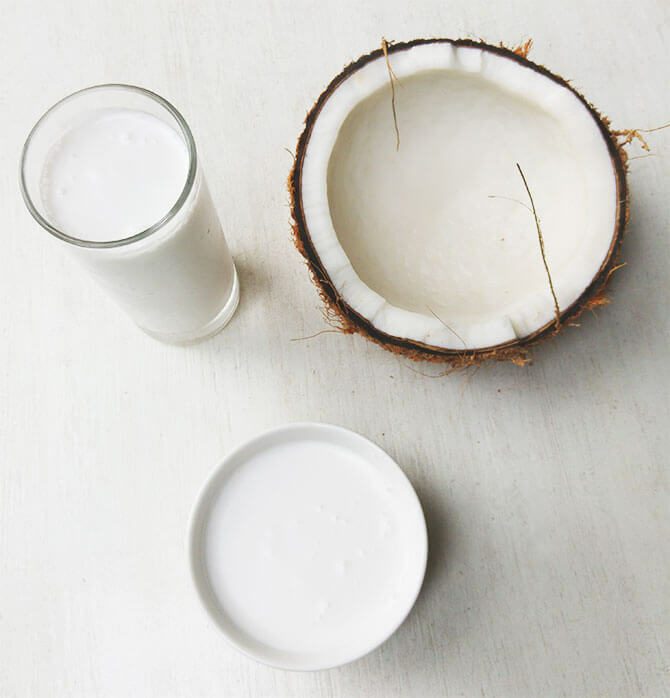 Coconut milk is rich in healthy fatty acids called MCT’s. MCT’s support healthy functioning of the heart, brain, muscles, skin, cells, bones, metabolism and more. Part of the MCT’s are immediately used as an energy source, so unlike most other fats they don’t get stored as fat. Another part of them converts into ketones which are literally brain food! Our brain consists mainly of fat and needs plenty of good fats to function properly. MCT’s have strong antibacterial properties that help protect your body. Coconut water is a refreshing, hydrating drink. You can also add it to your smoothies or make these beautiful ice spheres with sliced fruit and edible flowers. Coconut milk is great in both sweet as well as savory dishes such as soups and curries. It’s very tasty in hot drinks, as a coffee creamer or to make hot-chocolate with. 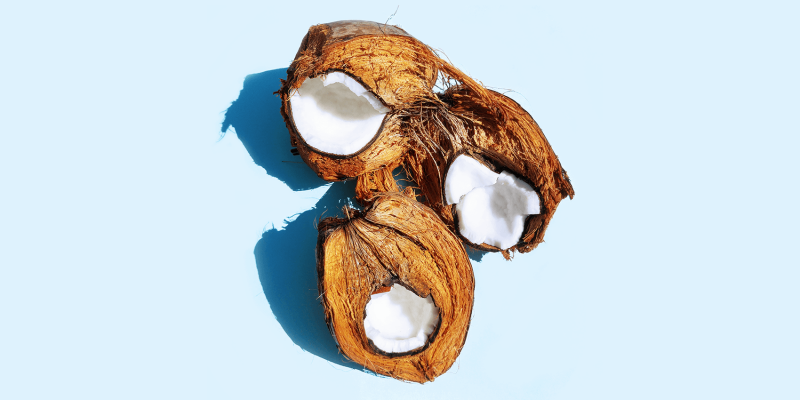 Do you know these other 21 delicious healthy coconut products ?